The first Dutch Accountability Hack took place on September 9, bringing together developers from all over the Netherlands to use open data to map the Dutch government’s money flows and performance. ‘TenderGalaxy’ was awarded the second prize, allowing users to interactively browse the connections between government entities, their published tenders and the businesses interested in these tenders based on the principles of interactive network visualization. Update June 2017: further historical data back to 2012 has been added as well; improved search functionality allows adding all search results to the visualization at once. Data on Dutch tenders is published on TenderNed (http://www.tenderned.nl) and includes detailed metadata on the tenders, publishing government entities and businesses. This also means that there are a wide variety of relationships between data points: tenders are connected to both the government entity which published them, as well as to the businesses that are interested in participating. 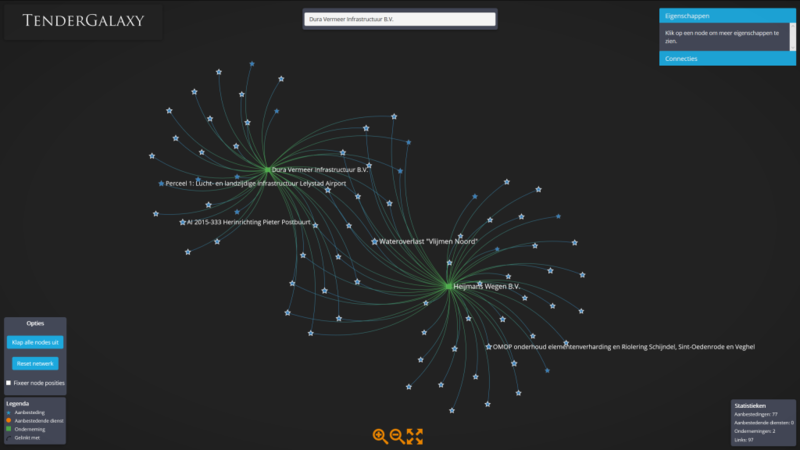 Interactive network visualizations are therefore a great way to visualize this type of data, allowing users to quickly gain insights into the relationships between data points. The full datasets include tens of thousands of nodes and numerous connections between them, which is too much to visualize in one go and would lead to immediate visual overload for users. Instead, the approach chosen during the hackathon was to allow users to incrementally build the network based on searches for specific tenders, government entities or businesses. Clicking a search result shows the direct connections of that specific node, which can then be expanded again to build up the network step by step. The connections of all visible nodes can be expanded all at once as well, enabling one to quickly sift through the dataset. This way of visualizing large networks is based on a paper by Frank van Ham and Adam Perer, which can be found here. Next to selecting individual search results, you can also click the + button next to the search box to add all currently available results based on a search. This makes it much easier to add activity based on certain keywords all at once, or to add various writing styles for the same organization in one go. Switching between years can be done using the Data box on the left-hand side. Please note that the interface of the tool is in Dutch. Loading the tool might take a few seconds because of the size of the underlying dataset. The dataset used includes data on all tenders published from 2012 to 2016. The data is not always complete – for example, some tenders do not include any information on the businesses which won them. Trying to expand those tenders will thus not add any information to the network. Any comments are most welcome! If you have any other datasets which would be suitable to visualize in the same way, just let me know so I can take a look.